It's my understanding that most human sensory systems obey an approximately logarithmic stimulus/response curve. This includes the visual system, auditory system, and the smallest perceptible difference on things like weight. Do we know the origin of this pattern? Is it something inherent in how neurons encode information and fire (for example, maybe the refractory period reduces neuron responsiveness to stimulus in just the right way relative to how information is encoded)? Or is it something that specifically evolved to give us the ability to handle a wide range of stimulus amplitudes? If it's the latter, how is the transformation from linear stimulus/response to logarithmic response achieved? First, the curves are not really logarithmic. where "a" could be greater, less than, or equal to 1. When "a" is 1, the curve is linear. brightness of a "point source briefly flashed"
If "a" = 0.5, the curve is a square root curve. 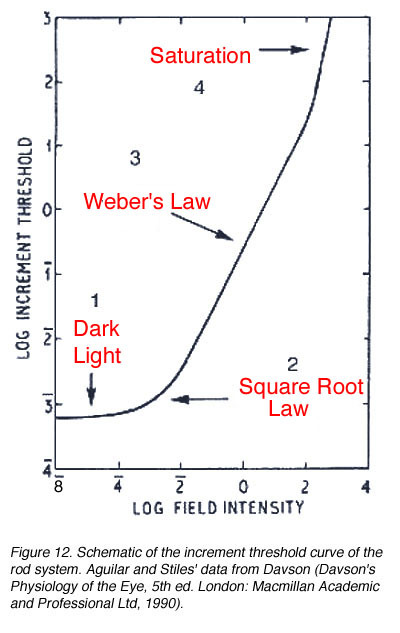 Brightness perception follows the square root (or de Vries-Rose) curve in some intensity regions, and a nearly-linear response in other (Weber's law) regions. Examples of "a" being positive are perception of electric shock and perception of heaviness of lifted weights. So, since the perception curves can be linear (a=1), more sensitive than linear (a>1), or less sensitive than linear (a<1), there is no general logarithmic property of neutrons that is responsible for the curves. Not the answer you're looking for? Browse other questions tagged neuroscience senses or ask your own question.